I got this recipe from the Bon Appetit Food Lovers Cleanse. I have a subscription to the Bon Appetit magazine and really enjoy it. In the latest edition, they reference this cleanse to do in the new year, for people who love food and wouldn't survive on the traditional juice cleanses. Hey wait, that's me! I looked up the cleanse online and find they have a lot of great recipes. However, I am terrible at following strict meal plans, and kind of forgot about it. Then I saw a friend of mine posted that she was about to start the cleanse. Although it was meant for the first 2 weeks in January, you could really do it anytime. It's free and BA provides all the recipes, grocery lists etc to help get you organized. I love seeing her photos of the meals, they look delicious! 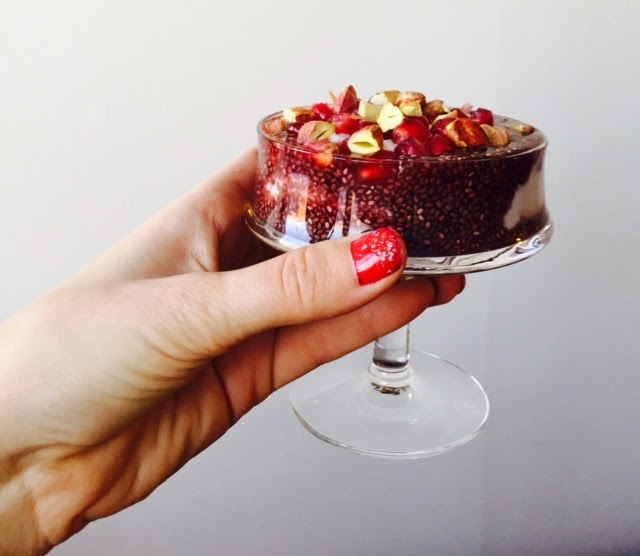 So it got me back on the website, and I decided that just because I wasn't doing it from start to finish, I could still try my hand at some of these healthy recipes. 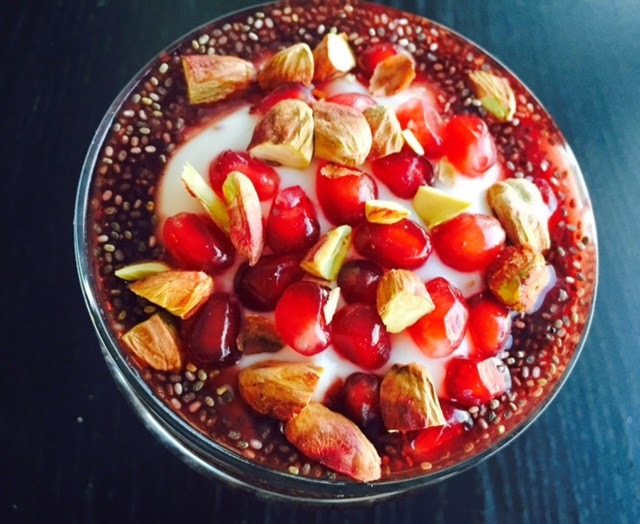 So voila- without further ado, this healthy, yummy, sometimes you need something different, breakfast! This recipe makes enough for 2 people. 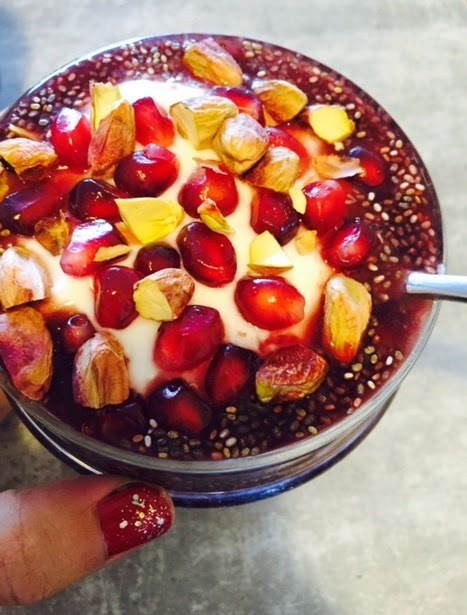 To make it for 1 person just cut the amount of yogurt in half and use the same amount of everything else. - 1-2 tablespoons peeled and chopped pistachios- I used lemon roasted ones so they were extra delicious, but any kind will do. 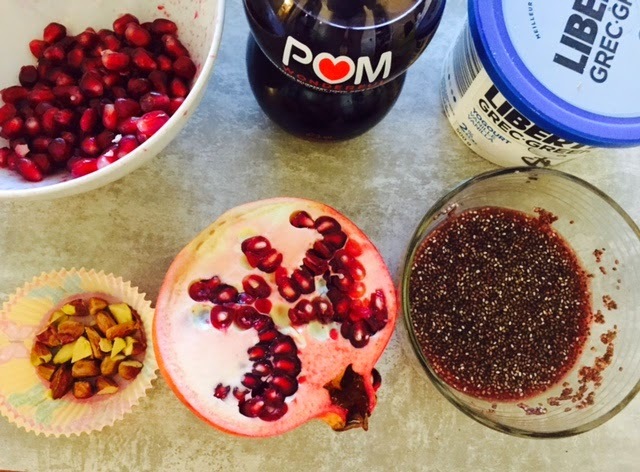 Instructions: Mix chia seeds and pomegranate juice and let sit 20 minutes (or overnight if you remember to do this the night before). 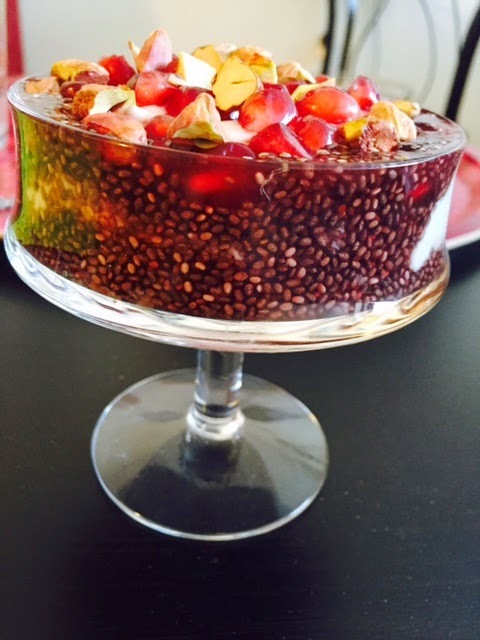 Then layer the chia mixture/ yogurt/chia mixture/yogurt, top with pomegranate seeds and pistachios.